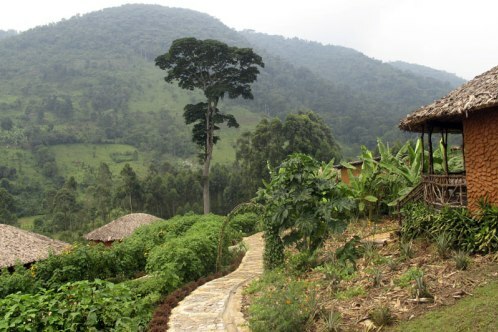 Located in Bwindi, Uganda the new Mahogany Springs Lodge offers luxury in the Virunga Volcanoes mountain range where over half the world's population of the endangered Mountain Gorillas live. The Gorillas clearly approve of Mahogany Springs - they are often seen sitting by the nearby Munyanga river soaking up the sun. The lodge was set up by Barrie Gotch who had previously travelled to Uganda to do the Gorilla Tracking. Despite loving the experience he was disappointed that the accommodation he stayed at charged "five-star prices but providing basic comfort and service levels". He was determined to return and build a lodge that provided luxury that could compete with the stunning scenery and wildlife. For the past four years this labour of love has seen Barrie travel between London and Uganda overseeing the built. All of the resort's suites have their own private veranda but for the ultimate luxury opt for the Presidential Suite which overlooks the river and faces the forest for the best vantage point for spotting the wildlife and taking in the views. Activities available at the resort obviously include the main draw, Gorilla Tracking where guests walk through the forest until discovering the Gorillas. The area is a must for any nature lover as it provides 120 species of mammals, 348 species of birds (more bird species per square kilometre than anywhere else on Earth), 220 species of butterflies, 27 species of frogs, chameleons, geckos and many endangered species and it is one of the most diverse forests in East Africa with more than 1,000 flowering plant species including 163 species of trees and 104 species of ferns. Mahogany Springs are highly committed to giving back to Uganda and the environment. They run a tree planting scheme to highlight offsetting some of the carbon they will have created by their trip. They lodge also sponsored an orphanage in Kampala, installed a tap for the local community to access clean, drinking water and have supported a local hydro-power project which will be providing electricity to the local area and hospital. The Luxury Travel Bible loves it when luxury is able to give back to the area while providing an awesome experience.